Criminal Lawyers in Shippensburg, Cumberland County PA.
Open Tues 5pm to 7pm – No Appointment Needed! Mooney & Associates provide clients with unique services. We meet with our clients when convenient for the client (day, evening or weekend) and a location that is convenient for the client (12 offices in South Central PA). We are available to our clients 24/7. Mooney & Associates provides experienced representation to our clients in a variety of law matter so that the client does not need to find a different attorney for each issue. The attorneys are experience litigators in Civil Litigation such as Personal Injury (motor vehicle accidents and all other types of personal injury matters), Workers Compensation, Social Security Disability claims as well as Criminal Defense – DUIs, traffic citations, summaries, misdemeanors and felonies. They also handle Family Law matters such as Divorce, Custody and Support. Mooney & Associates assist client file for Chapter 7 and 13 Bankruptcies. Mooney & Associates creates thorough Estate Plans, not just Estate Documents such as wills, power of attorneys and health care directives. They create a plan that protects your assets and plans for Medicaid. They offer Real Estate services including providing Title Insurance. They assist Veterans with obtaining Benefits. Call us today to arrange for an appointment at a convenient time for you in our Shippensburg office! Head west on US-11 S/State Route 74 N toward S College Street. Continue to follow US-11 S. Office will be on the left. Head southeast on National Pike/E Washington Street toward Renaissance Way. Turn left onto North Locust Street. Take the first left onto East Franklin St/ National Pike. Merge onto I-81 N via the ramp to Harrisburg. Take exit 24 for PA-696 N/S Fayette Street. Turn right onto West King Street. Office will be on the right. Head northeast on East King Street toward South Christian Street. Turn left onto North Lime Street. Turn right onto PA-23E/E Chestnut Street. Turn left to merge onto US 30 West. Slight left on PA-283 W (signs for Harrisburg). Take exit onto I-283 N toward I-81/I-83/Harrisburg. Take exit 3A on the left to merge onto I-83 S toward Harrisburg. Continue onto PA-581 West. Continue onto US-11 South. Continue onto PA-581 West. Take exit 1B on the left to merge onto I-81 South toward Carlisle. Take exit 29 to merge onto PA-174 W/Walnut Bottom Road. Turn left on PA-533 W/US-11 S/East King Street. Office will be on the left. Head east on Fannettsburg Road W/State Route 4004 toward PA-75 N/Path Valley Road. Turn right onto State Route 4004/Upper Strasburg Road. Continue onto PA-533 E/Orrstown Road. Turn left onto West King Street. Office will be on the right. Across from Pague & Fegan Hardware Store and just a few blocks down from the Post Office. One block from the square at King Street and Earl Street. 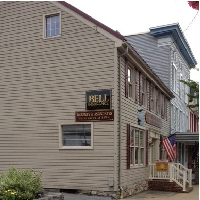 Signs on the side of the building read “Bell Insurance” and “Mooney & Associates.” (Tan siding with burgundy shutters). Please only use hotline after 5:00pm and weekends during Emergencies.